Your right to privacy is very important to us. When you choose to provide us with information about yourself, we recognize that you trust us to act in a responsible manner. It is our belief that this information should only be used to help us provide you with better products and services. Name - Your first and last name help us to personalize your online experience. For example, the Portfolio section may feature your first and/or last name. This information is only visible to you - we will not disclose your first or last name to any person, or to any third party without your permission. Email Address - By providing your email address, you can receive important messages via your existing email account. We will not disclose your email address to any person, or to any third party without your permission. 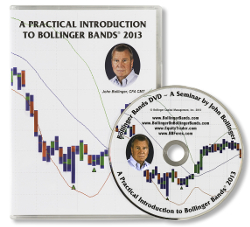 When you browse through BollingerBands.us we collect certain information to measure how many users come to the various sections of the site so we can make the site more useful. TraderLink (TL) will not disclose personal information about current or former clients to third parties except as permitted or required by law. We are committed to safeguarding the privacy of the information we collect and maintain physical, electronic and procedural safeguards to guard information. 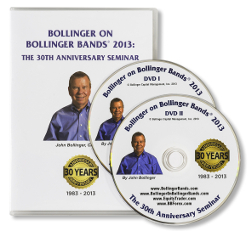 All information in or related to BollingerBands.us (SERVICE) is for individual use only. Subscriber acknowledges and agrees that TraderLink (TL), Bollinger Capital Management, Inc. (BCM) and any other providers of information to the SERVICE exclusively own all the rights, title and interest in and to the information provided through the SERVICE and all proprietary rights in such information. Reproduction, distribution and transmission of any information obtained from the SERVICE or representatives of SERVICE is strictly prohibited, except with prior written permission from TL. Subscriber further agrees not to use or permit anyone to use the information provided through the SERVICE or representatives of SERVICE for any unlawful or unauthorized purpose. Neither TL, BCM or anyone else involved in creating, producing, or distributing SERVICE warrants that it will satisfy the subscribers' requirements or that the product and/or data will be error-free. This product and any related data or communications are distributed 'as is' without any warranties of any kind, either expressed or implied. Subscriber acknowledges that the SERVICE is a mechanical price forecasting system and, as such, is subject to errors. Neither TL, BCM or anyone else involved in creating, producing or distributing SERVICE or any providers of information make any warranties, expressed or implied, as to the use or the results to be obtained from use of any information provided by TL, BCM, SERVICE and/or their representatives including, without any limitation, any warranties of accuracy or fitness for a particular purpose or use. By subscribing, Subscriber warrants that Subscriber is experienced in the financial markets and expressly acknowledges the risks inherent in the financial markets. Subscriber acknowledges that any and all decisions related to the purchase and sale of securities and/or their derivatives shall be based on Subscriber's knowledge and experience and shall therefore hold harmless TL, BCM, SERVICE and/or any representatives of TL, BCM and SERVICE. Neither shall TL, BCM or anyone else involved in creating, producing, or distributing SERVICE or any of its providers of information have liability for the accuracy of the information contained in the SERVICE, or for delays in providing the information, or omissions therein. None of the foregoing parties shall be liable for any third-party claims or losses of any nature, including, but not limited to, trading losses, lost profits, lost savings, punitive, indirect, special, incidental, or consequential damages, even if TL, BCM had been advised of the damages. This Agreement supersedes all other agreements and understandings regarding this subject matter and is governed by the laws of the State of California and United States law without regard to conflict of laws and provisions thereof.